(Bloomberg) -- One of the top hedge funds in the Nordics is betting only on life and death. The Stockholm-based hedge fund manager, Resscapital AB, is active in the U.S. market for so-called life settlements, in which retirees sell their life insurance policies to a third party at a discount. The fund only buys policies after an independent medical underwriting to estimate life expectancy, profiting if it turns out to be accurate. The market has been growing in the past years, making it easier to invest, according to Hagerud. The fund delivered a return of 9.9 percent in 2018, beating the average loss of 3.5 percent for the Nordic Hedge Index. 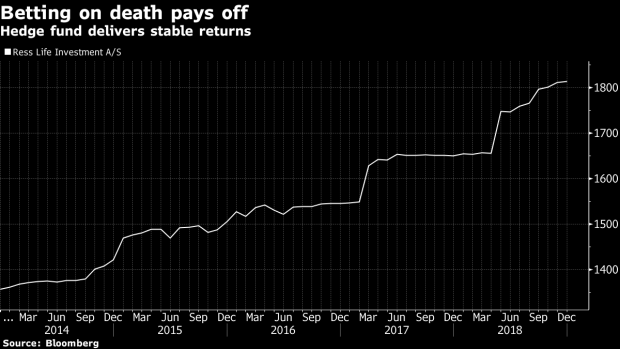 It targets an annual net return of 7 percent with low volatility and has achieved an annualized return of 6 percent over the past five years. Resscapital, which manages $117 million for Copenhagen-listed Ress Life Investments A/S, holds more than 200 U.S. life insurance policies from insurers such as John Hancock, Lincoln International and AXA Equitable. The total nominal face value is around $450 million. Investing in alternative fixed income with the main risk being longevity makes the fund uncorrelated to the stock markets and business cycles. Instead, an acceleration of U.S. inflation poses the biggest risk, according to Hagerud.